It's beginning to look a lot like Christmas around here. Well not in my house anyways, but in the MarkerPop store it is. There's a lot of new arrivals of Holiday products from all your favorite brands. We are also welcoming Concord and 9th to the shop this month. For my project today I'm using Concord and 9th's Sophisticated Script and the Shine Brighter stamp sets. These will be available on Aug. 31st but you can pre-order them now. 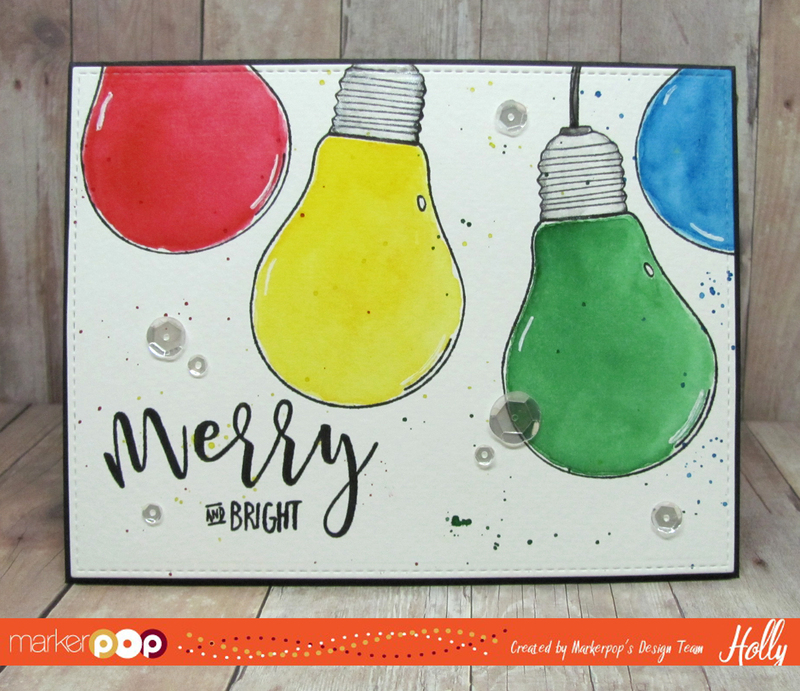 I stamped the images from the Shine Bright set onto some Watercolor Paper using VersaFine Onyx ink and my Misti Tool. Then I colored in each of the bulb images with the Kuretake Gansai Tambi Watercolor set. I used the colors: No. 35 Carmine Red, No.43 Mid Yellow, No.52 Ocean Green, No. 62. Cobalt Blue and No.20 Black. I used the Black on the tops of the lightbulbs just along the edge. I used a small amount and then faded it out with a damp clean brush. I was trying to make it look Silver. I have the Large 36 set and it includes No. 95 Silver I added a tiny bit of that over the top of the bulbs then dabbed it off with a paper towel to give it just a hint of shimmer. You could also achieve this with a Wink of Stella pen. After the images were dry I added a few splatters of the same colors around each bulb. I die cut the panel with the My Favorite Things Blueprints #15. 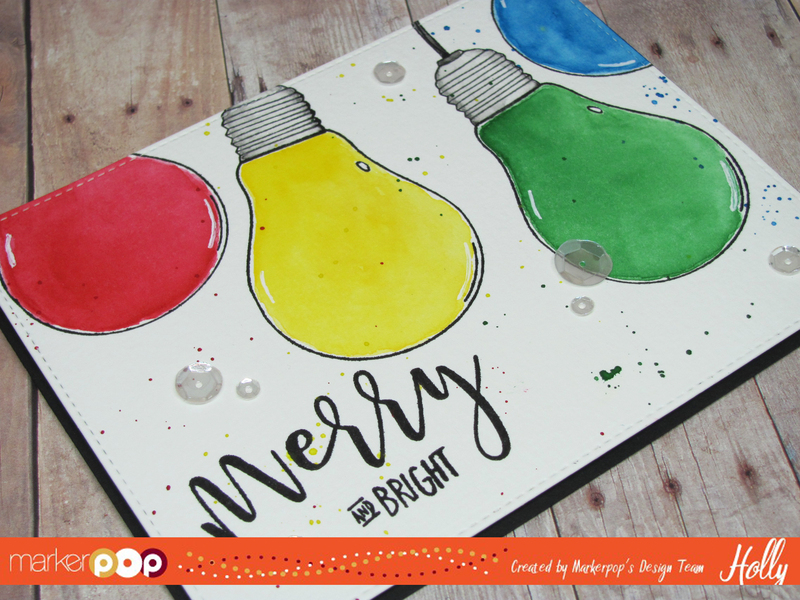 I lined the Sophisticated Script letters up in the Misti and stamped the word Merry. And then I used the Merry and Bright sentient from Shine Bright and covered the Merry portion and selective stamped and Bright. Once everything was dry I added some foam tape to the back of the panel and adhered it to a Black Licorice A2 size Card base. For a touch of Sparkle I added some Pretty Pink Posh Sparkling Clear Mix Sequins. For a highlight on each bulb I added some lines with a White Gel Pen. Be sure to head over to the store and check out the Concord and 9th Collection and grab your favs! !